Light: Being in love. Showing your love to others. Expressing passion or romantic feelings. Aligning yourself with groups or like-minded others. Bringing people together. Making well-informed decisions. Shadow: Debilitating passion. Allowing an unhealthy desire for love to motivate destructive behavior. Disrupting unity. Working against the best interests of those who care about you. Ill-informed decisions. Mythical/Spiritual: Obviously, Adam and Eve, who are depicted in RWS-influenced decks. Also Venus and Cupid, Aphrodite and Eros. Story: The main character encounters a love interest or must choose between love and doing what is right. Relationships. This is a time to celebrate unity, love, and romance in all its forms. Souls are coming together, and a unique opportunity exists for people to enjoy an unusual degree of interdependence and cooperation. Let your heart guide your choices today. Work. Call group meetings, pursue mergers, and find solid business partners during this rare opportunity for successful cooperation. Pay special attention to opportunities to supply what others need. Lay a foundation for future success by watching for team members with skills you lack. Make choices based on what you truly enjoy doing. Spirituality. Open yourself to new and diverse spiritual experiences. See opportunities to love others (even romantically) as chances to be a channel for divine love. Every small blessing you receive is an expression of universal love; give thanks and embrace what life brings you. Personal Growth. Now is a good time to deal with outstanding issues related to sexuality and relationships. Rather than be overwhelmed with Hollywood-style passion, consider the extent to which your qualities might be balanced or enhanced by those of your potential partner. In other areas, find your passion and pursue it. Fortune Telling. A new personal or professional relationship blossoms. Sexual opportunities abound. Unexpectedly, a friend becomes a lover. The angel. Whether seen as Cupid (in the Marseilles deck) or Eros (in the RWS-influenced decks), the influence of the angel draws the lovers together. If you were Cupid, whom might you bring together to resolve your challenge? The trees. Adam and Eve ate of the Tree of the Knowledge of Good and Evil but were driven out of the Garden of Eden before they could partake of the Tree of Life and become “as gods.” Choices have consequences; note how RWS-influenced deck and the Marseilles deck all drive this point home. The serpent. An expert at manipulating loopholes, the Biblical serpent tempted Eve. In your situation, should you honor the letter or the spirit of the law? The wedding. Centuries ago, alchemists (the forefathers of modern chemists) used the phrase “the Alchemical Wedding” to describe the moment when long-divided opposites were brought together to create something new. They saw this reunion as a symbol for personal transformation and, eventually, enlightenment. What enlightenment might you achieve by bringing together opposing points of view? The players. 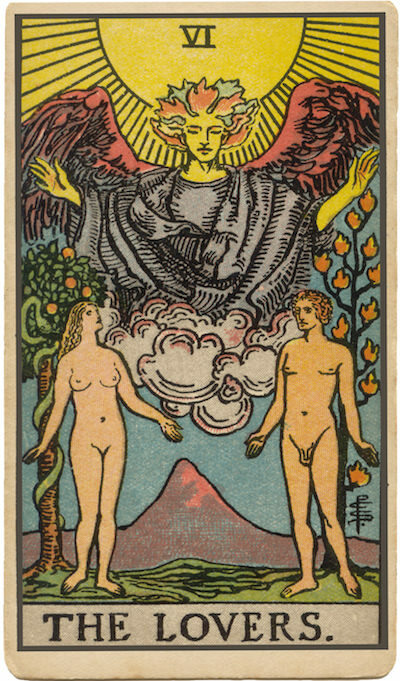 RWS-influenced decks depict Adam and Eve. The Marseilles decks depict a young man making a choice between two women: a young wife and (depending on whom you ask) his mother or an older woman. Who are the players in your situation, and what choices do they face? What is my heart leading me to do? How might this decision transform me as a person?